Here is What Have We Learned from Week of the 2017 NFL Season, thanks to the AP Pro 32 for photos & help in this article. What began more than a year ago with an NFL quarterback protesting police brutality against minorities by kneeling silently during the national anthem before games has grown into a roar with hundreds of players sitting, kneeling, locking arms or remaining in locker rooms — their reasons for demonstrating as varied as their methods. Yet people rallying to defend players or decry the protests aren’t talking about police brutality, or the fact that former San Francisco 49ers quarterback Colin Kaepernick is no longer employed by an NFL team. Especially after President Donald Trump weighed in repeatedly to say that players should stand for the anthem or be fired for their defiance. Before NFL games began Sunday, the discourse had morphed into a debate over the First Amendment, Trump’s insults, how much the NFL has been paid by the U.S. government for its displays of patriotism and the overall state of race relations in America. Support and criticism came from fields well beyond the gridiron, including NASCAR, the NBA, MLB, activists, journalists, entertainers and politicians. Some worry that the expanded reasoning for the protests — fanned by the president’s incendiary stance — could dilute the passion and the permanence of its original cause, drawing attention to interactions between police and minorities. “The issue has morphed beyond that because Mr. Trump has interceded,” the Rev. Jesse Jackson said. Trump continued to criticize protesters Tuesday, saying in a news conference at the White House that he was “ashamed of what was taking place” with the kneeling protesters. Trump said Americans have died and been injured in defense of their country. “They were fighting for our flag, they were fighting for our national anthem and for people to disrespect that by kneeling during the playing of our national anthem, I think that’s disgraceful,” the president said. Trump’s remarks set off a firestorm on social media. Ken Miles, a community organizer and entrepreneur living in Harlem, created a petition on Saturday around the emerging #TakeTheKnee hashtag in response. “He doesn’t understand the power that he has for being the leader of this beautiful country,” Cleveland Cavaliers star LeBron James said. Fans are also noting the mixed messages. Conley said fans watch the NFL for entertainment and “now it’s turning into an activists’ platform,” referring to domestic violence, player safety, race and other issues. It’s unclear whether — or how — the momentum will continue. On Monday, Jackson called for a boycott of the NFL — some African-Americans have been doing that since the start of the season earlier this month — and picketing at pro football stadiums. Some want the original intent of the protests to become the focus again. 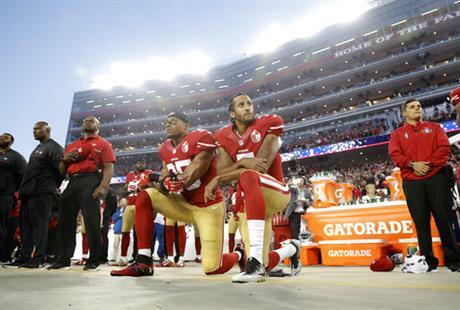 Congressional Black Caucus chair Cedric Richmond noted that while some NFL owners, coaches and officials put out statements rebuking Trump, they didn’t include why players originally felt the need to protest. Miles said that while the support has taken various forms, people are leveraging their platforms to keep issues of systemic racism top of mind. Corey Williams in Detroit and Tom Withers in Cleveland contributed to this report. Williams, Holland and Whack are members of The Associated Press Race and Ethnicity Team. Holland reported from Washington and Whack reported from Philadelphia. Packers rookie defenders make key plays in OT win-The Packers got a glimpse of what their top two draft picks are capable of during Sunday’s win over the Cincinnati Bengals, with hybrid safety/linebacker Josh Jones and cornerback Kevin King making their first NFL starts. “Anytime you can get your young players in there and get that experience, (it’s valuable),” Packers coach Mike McCarthy said Monday, one day after the team’s 27-24 overtime victory over the Bengals. “The plan is to win the game but you’re always, always very cognizant — I always have been — of getting these young players in. King and Jones had an impact on an unseasonably hot September Sunday, too. Also among those impressed by the two youngsters, especially with Jones: Packers quarterback Aaron Rodgers, who led a 75-yard fourth-quarter touchdown drive that forced overtime, then hit Geronimo Allison for a 72-yard catch-and-run to set up Mason Crosby’s game-winning field goal. Jones, who didn’t play a single snap on defense against Seattle in the Sept. 10 regular-season opener for his NFL debut, registered a team-high 12 tackles and had two sacks and three total tackles for loss. “He was fantastic, he really was. It’s fun to watch him play and get confident,” Rodgers said of Jones. “(That’s important) for young players like that, and for Josh especially. Jones played the hybrid linebacker position as one of four safeties the Packers played for most of the game Sunday. With safety Kentrell Brice (groin) and inside linebacker Jake Ryan (hamstring/concussion) out, Jones played the linebacker role, veteran Morgan Burnett worked in the slot and Ha Ha Clinton-Dix and Marwin Evans served as the traditional safeties. The approach worked, as the Packers limited the Bengals to just 109 second-half yards and did not allow them to convert a third down (0 for 5) after halftime. “It’s satisfying to know that your preparation paid off, but this is a long season,” said Jones, who made a crucial tackle on a third down to end the Bengals’ only possession of overtime, leading to a punt and setting up the game-winning field goal. King (No. 33 overall) and Jones (No. 61 overall) were both taken in the first round by a Packers team that clearly needed to upgrade the defensive personnel, particularly in the secondary. With veteran cornerback Davon House (quadriceps) not playing Sunday, and with third-year corners Damarious Randall and Quinten Rollins each having struggled the previous week against Atlanta, defensive coordinator Dom Capers gave King the task of covering Bengals six-time Pro Bowl wide receiver A.J. Green. Although Green did catch 10 passes for 111 yards and a touchdown — the 10-yard TD, however, came against zone coverage, not against King — his longest reception went for 20 yards. Given the kind of game-changing plays the Packers secondary has had a penchant for giving up against top receivers, keeping Green from breaking the game open was an accomplishment. King figures to start again on Thursday night against Chicago, even if House is cleared to play. Titans showing signs of growing up with best start since 2013- Tennessee tight end Delanie Walker smothered the ball on the onside kick attempt inside the final two minutes. Not too long ago, the Titans botched those crucial plays while finding new ways to lose as one of the NFL’s worst teams. Now they are showing signs they have learned how to make the plays that finish off victories. Call it a sign of growing up. The Titans finished last season 9-7, a six-win improvement from going 3-13 in 2015 to pick up the No. 1 overall pick in the draft. General manager Jon Robinson flipped that selection into a handful of other players , and Mularkey has tried to mold the Titans into a physical group that competes hard every minute. The combination has the Titans off to a 2-1 start and atop the AFC South. It’s the franchise’s best start since opening 3-1 in 2013, though that squad finished 7-9 with coach Mike Munchak fired at the end of the season. The Titans are doing it in the “exotic smash-mouth” approach Mularkey wants too. They rank second in the NFL averaging 156.3 yards rushing after running all over Jacksonville in a 37-16 win in Week 2 followed by 195 more in a 33-27 win over Seattle . They also have allowed quarterback Marcus Mariota to be sacked only twice this season. Credit Mariota with perhaps the biggest growth. Mularkey said Monday the third-year quarterback managed to get the Seahawks, better known as the “Legion of Boom” on defense, to jump five times. Frank Clark jumped offside, and the Titans took advantage with Mariota’s screen pass to Rishard Matthews. The receiver finished off a 55-yard TDthat put Tennessee ahead to stay. The added bonus came with the Seahawks not managing even one hit or sack on Mariota. “Not only do you get obviously the penalties, but you also get them to a point, how aggressive do they want to come off the ball based on the cadence,” Mularkey said. Mularkey also said Mariota helped coaches get their receivers to run better routes after a struggling start on eight of the Titans’ first 12 plays. The Titans face their next test Sunday when they visit Houston (1-2), the two-time defending AFC South champs, in the first of a two-game road swing. Mariota said the Titans are expecting to win games now thanks to the culture Mularkey and Robinson have built. The Texans couldn’t close out their game against New England, but Houston is encouraged by the marked improvement of rookie quarterback Deshaun Watson in his second NFL start. Watson threw for 301 yards with two touchdowns and two interceptions and ran for 41 yards in Houston’s 36-33 loss to New England on Sunday. Watson started the season backing up Tom Savage, but took over at halftime of Houston’s season opener when Savage struggled against the Jaguars. The 12th overall pick in the draft has looked increasingly comfortable leading the offense as he’s gained more experience. He’ll have a chance to do that on Sunday as the Texans (1-2) return to AFC South play when they host Tennessee (2-1) in the first of three straight home games. O’Brien has been impressed with Watson’s ability to adjust quickly when problems arise and that he doesn’t make the same mistake twice. Watson is the most mobile quarterback the Texans have ever had, and his teammates rave about his ability to extend plays with his feet. That skill was on display in Sunday’s game when he evaded four tackles before launching a 31-yard pass to D’Onta Foreman in the fourth quarter. Another impressive quality about the 22-year-old quarterback has been the confidence he’s shown since the moment he stepped on the field in the third quarter of Houston’s opener. He continued to show the same unflappable nature that was on display last season when he led Clemson to a national title. Watson said he’s been confident all his life and that he isn’t going to change simply because he’s now playing against the best football players in the world. “You can’t have (any) doubt when you step on the field at this level,” he said. This week he and the Texans could get a boost with the possible return of speedy receiver Will Fuller. The second-year player, who was a first-round draft pick, has missed the first three games after breaking his collarbone early in training camp. “I think that’ll be something that we’ll see starting on Wednesday, but I’m hearing some good things,” O’Brien said. The 50th season in Bengals history started with banners and on-field honors for some of the franchise’s greatest players. It’s quickly turned into a reminder that the last half of their history has been more frustrating than anything else. The Bengals remain winless after the Packers rallied for a 27-24 overtime victory at Lambeau Field on Sunday. They’re 0-3 for the 14th time in franchise history, leaving them with long odds of ending their most stubbornly enduring streak. Cincinnati hasn’t won a playoff game since the 1990 season, the sixth-longest stretch of postseason futility in league history. The Bengals are 0-3 for the first time since 2008 , when they finished 4-11-1. Odds are they’re not going to be able to pull out of it. No NFL team has lost its first three games and reached the playoffs since the 1998 Buffalo Bills. The Bengals have never finished with a winning record after losing their first three games. The best they could muster were 8-8 finishes in 1984 and in 2003, Marvin Lewis’ first season as head coach. Lewis is in the final year of his contract, so this 0-3 carries a lot more weight. There’s a chance to stop the tailspin next week at Cleveland — also 0-3 — before a home game against Buffalo (2-1) and a bye week. The offense in Green Bay was better under new coordinator Bill Lazor, who took over for the fired Ken Zampese after a 13-9 loss to Houston . A.J. Green caught 10 passes for 111 yards and his first touchdown after getting 10 catches in the first two games combined. The Bengals scored a touchdown on their first possession, ending a drought of 25 series without getting into the end zone. But they managed only three points in the second half, a familiar problem from last season when they’d have fast starts and accomplish little after halftime. The historically bad offense was the main problem in the first two games, while the defense played well overall. In Green Bay, the defense contributed William Jackson III’s interception return for a touchdown that helped the Bengals surge ahead 21-7, but they couldn’t contain Aaron Rodgers when it mattered. He completed 10 of 12 passes for 71 yards during a 12-play, 75-yard drive that culminated in his touchdown to Jordy Nelson with 17 seconds left, tying it 24-24. Rodgers’ 72-yard completion in overtime set up the winning field goal and got his first career victory in overtime — he’d been 0-7, including the playoffs. Linebacker Vontaze Burfict is eligible to return after completing a three-game suspension from the NFL for his latest egregious hit. He’s expected to start in Cleveland. Last year, he also served a three-game suspension, started the fourth game and was on the field for 34 of 45 plays during a 22-7 win over the Dolphins. Bengals players locked arms as a sign of unity during the anthem in Green Bay. Lewis said he was proud of their gesture. He’s not sure whether they’ll do it again in Cleveland. The New York Giants have fallen into a deep pit three games into the season, and their chances of getting out are not good. Only five teams that started the season 0-3 since 1980 have rallied to get to the postseason. The last was Buffalo in 1998. Compounding the Giants’ problem is that they are now 0-2 in the NFC East. Coach Ben McAdoo on Monday reiterated the Giants’ problems are mostly self-inflicted in discussing their heart-breaking 27-24 loss to the Eagles on a last-second, 61-yard field goal by rookie Jake Elliott. There were 10 penalties; a dropped touchdown pass by Sterling Shepard; a failed fourth-down run from the 6-inch line; a shoddy run defense; bad tackling; a 28-yard punt with the game on the line; and no running attack. McAdoo, who last year led the Giants to an 11-5 record and their first playoff berth since the 2011 season, isn’t worrying about missing the playoffs. After 11 miserable quarters, the offense finally woke up and scored 24 fourth-quarter points with Eli Manning throwing for two touchdowns to Odell Beckham Jr. and one to Shepard . Aldrick Rosas gave New York a 24-21 lead with a 41-yard field goal with 3:08 to play, but Elliott kicked two in the final 51 seconds. McAdoo refused to say much about the unsportsmanlike conduct penalty against Beckham following his first touchdown catch. The dynamic receiver, who had nine catches for 79 yards and two TDs, including another one-handed one , was flagged for pretending to urinate like a dog. When asked if the team was embarrassed by Beckham’s actions, the coach said he had given his answer. McAdoo took the blame for the Giants’ failure to get into the end zone on the fourth-down play from the goal line in the first half. He called a run against a nine-man front and Orleans Darkwa lost a yard. “I need a better call there,” McAdoo said, noting that his two outside receivers were better targets on the play. NOTES: DE Olivier Vernon is going to be day to day with an ankle injury. … There was no update on Darkwa’s back injury. … McAdoo refused to comment on an allegation made by an Eagles’ fan that Giants WR Brandon Marshall spit at him during pre-game warmups.